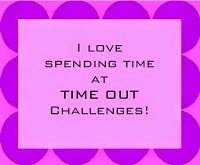 Oh my, wait until you see what I have to share with you today from the new My Time Made Easy February release! 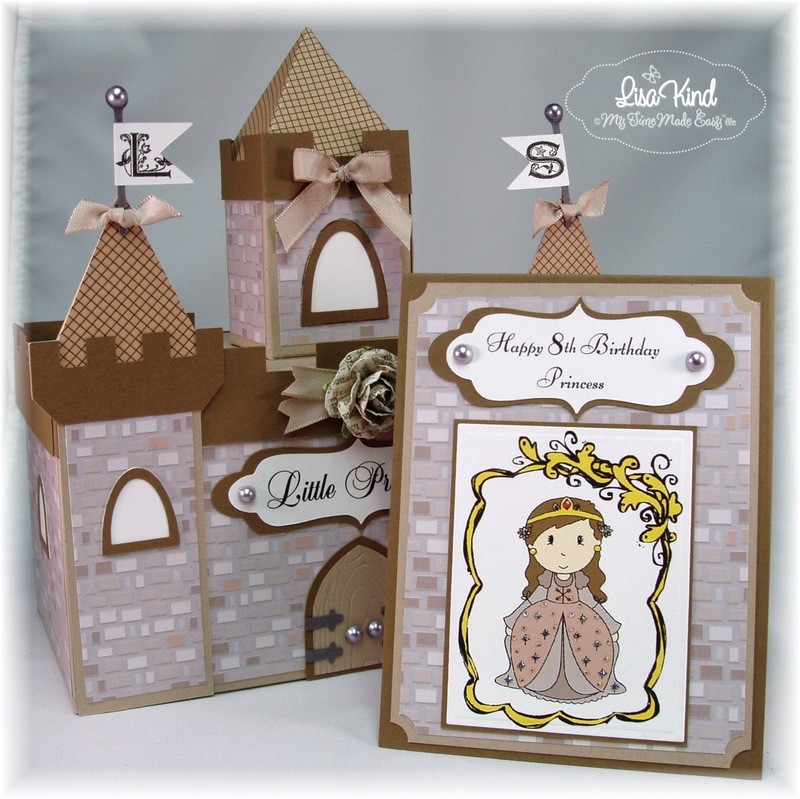 It's all about princesses, girls, so put on your glass slippers and be prepared to be enchanted! This new template is called Castle in the Clouds and it is really amazing! (I know I always say this, but it's true!) Here it is, a castle for a little princess! 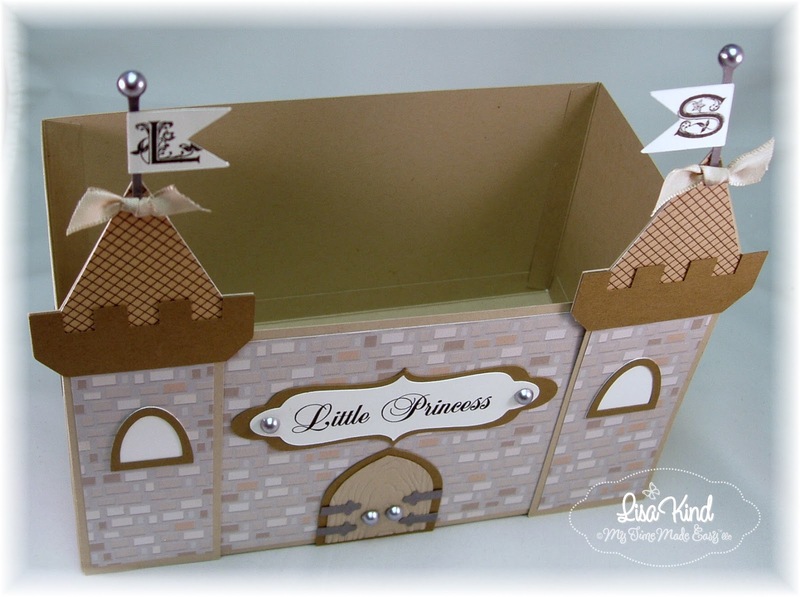 I've been watching Downton Abbey and fashioned my castle after the brown tones of that castle. 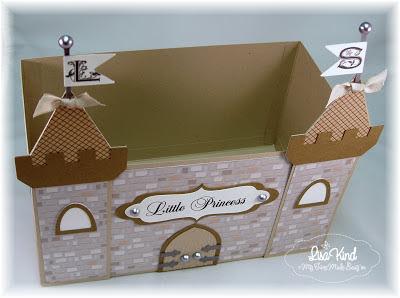 This template looks daunting (I cringed when I first saw it), but with Lauren's step-by-step directions it came together in a snap! The base of the box was cut with Crumb Cake card stock. Then I accented it with Soft Suede cardstock. The "bricks" is actually digital paper from MTME called Construction Materials. I just love this whole set of paper! The top of the three towers was also created with paper from this set (the top one looks like a different color, but it's the same as the other two...bad lighting!). I added the initials "LS" to the flags for the little girl I'm giving this to for her birthday. 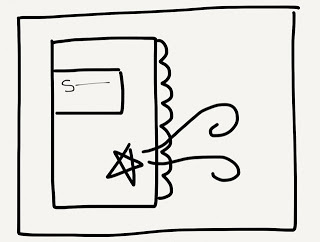 (I actually had a "DA" on the flags for Downton Abbey, but changed them when I decided to give this to Leah. I thought she'd like that better.) 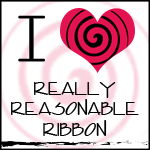 I also added some ribbon, a flower and pearls. 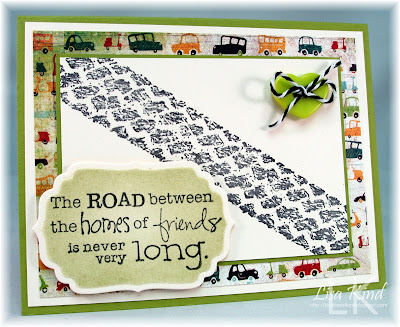 The sentiment is from the new Simply Enchanting digital stamp set. I placed it on a label from the previously released Fabulous Frames cut file. Some of the other DT members are posting today, so make sure you stop by these blogs. These new products will be available for purchase on Friday, February 1. We'll have another preview tomorrow before the Friday release, so stay tuned! Happy Saturday! There is a great inspiration challenge going on over at Just Us Girls. 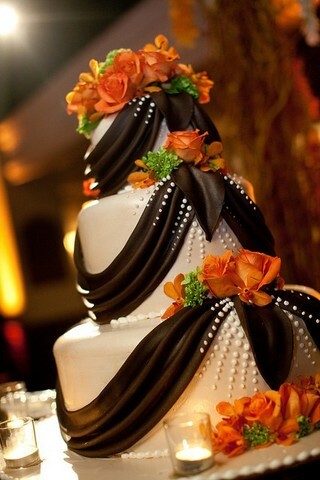 Marisa chose this photo of this beautiful wedding cake (I'm assuming it's a wedding cake! ).﻿ Here's a bigger picture of it so you can see all the details better. This would have been beautiful at my wedding! 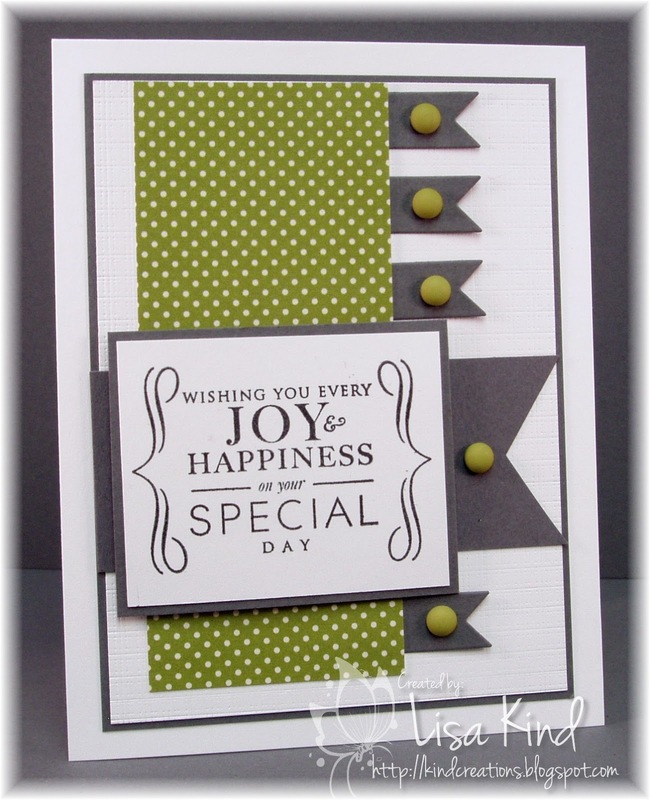 I love these colors and had so much fun putting this card together! I took almost all the elements from the photo and used them in my card. I started with the white panel. Instead of leaving it plain, I used a stencil from Ranger called Dotted Flowers and sprayed it with Perfect Pearls. It's hard to see in the photo, but it's really shimmery and quite pretty! Then I found this perfect patterned paper from My Mind's Eye called Mabel. It fit the color scheme perfectly. 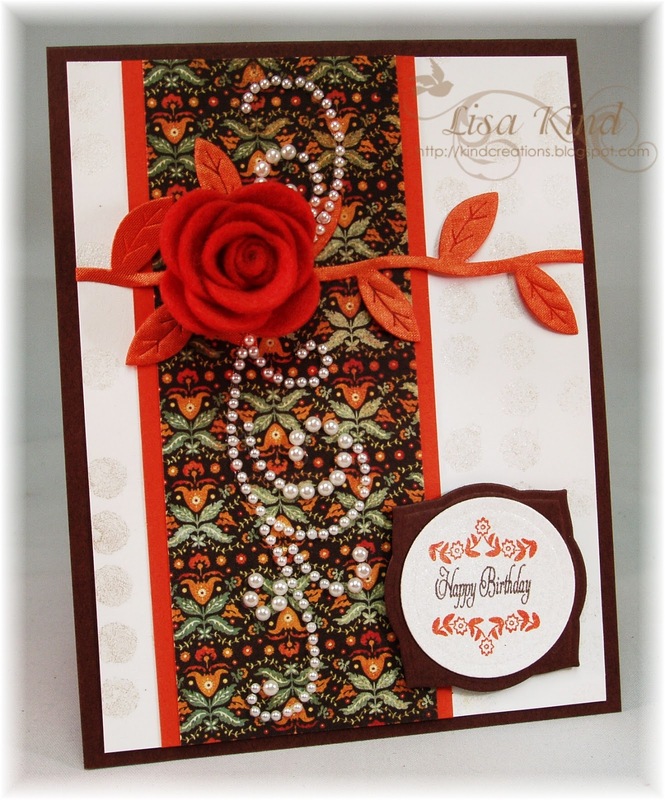 I used the Rolled Rose die from My Favorite Things and some orange felt from Papertrey Ink to made the pretty rose. 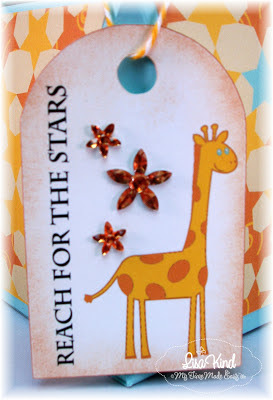 Then I found this orange leaf ribbon from Want to Scrap that has been sitting on my desk that I of course had to use! I added a pearl flourish also from Want to Scrap to tie into the pearls on the cake. The sentiment is from Tending the Garden by My Time Made Easy. 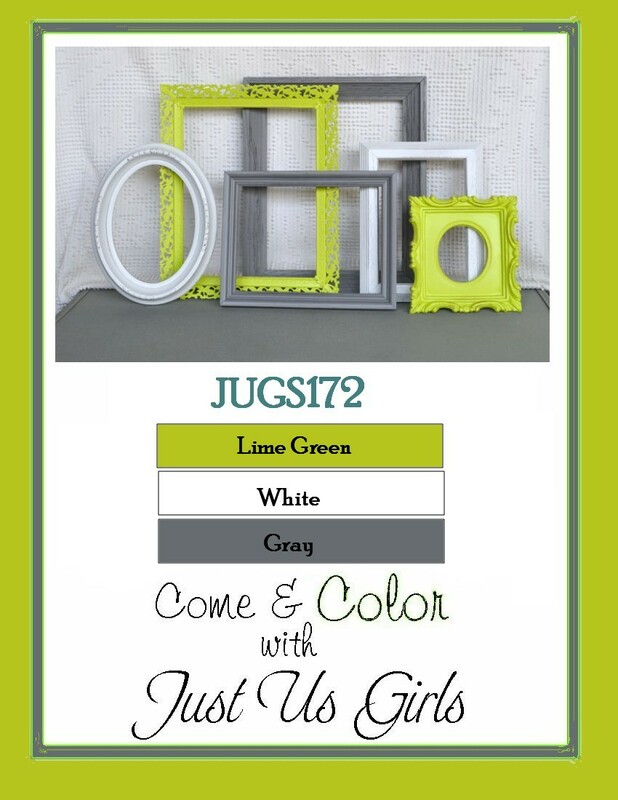 The JUGs design team has some beautiful creations to inspire you. Stop by these blogs to see more. Happy Saturday everyone! We have a great color challenge going on over on the Just Us Girls blog. 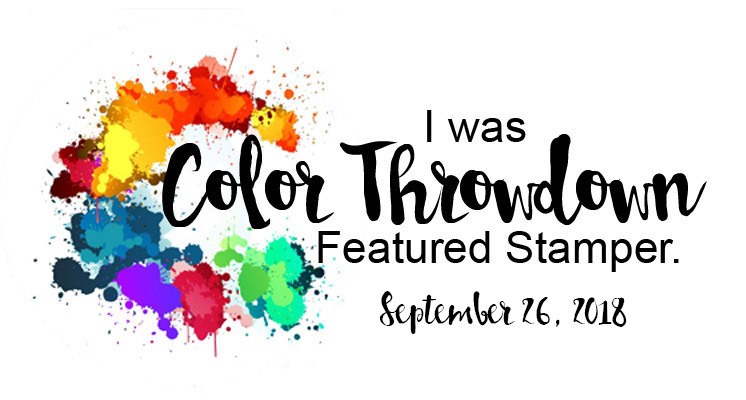 Vicki chose these fabulous colors! LOVE them! Here's my take on the colors. 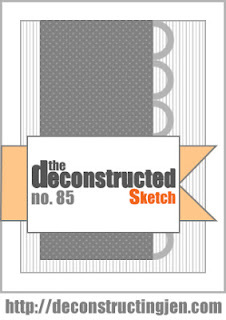 I used this week's Deconstructed Sketch (bummer that I missed her DT call, cause I love her sketches!). 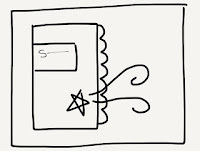 I also loved Jen's sample with those little banners peeking out from behind the middle panel, so I just had to CASE that! My dp is from the Family Ties pack by Pebbles. The middle white panel was run through the canvas impression plate from PTI. The sentiment is from the Half and Half stamp set, also from PTI. I added the lime green candy dots on each banner. The small banners were cut with dies from WPlus9 Designs. Here's the fabulous sketch. I see my friend and fellow JUGs designer Tangii used the same sketch! Great minds! LOL!! Here are some links you can go to for more inspiration. Thanks for popping in today! I hope you have a great long weekend! Today is Saturday (yeah!!! 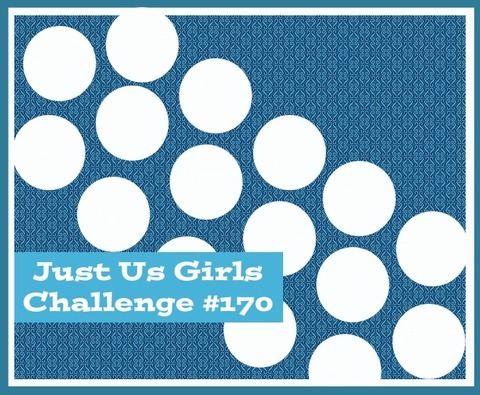 ), so that means it's time for another Just Us Girls challenge. This week is a technique challenge and Maria is giving us two options this week: Use the Double Embossed Enamel technique found here or just ink up your dry embossing. 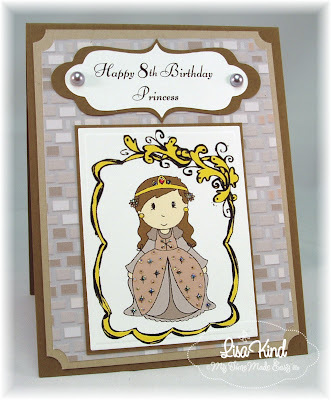 I chose to ink up my dry embossing. I actually had this embossed piece already inked up, so I decided to use it. I stamped the bee from Tending the Garden stamp set from My Time Made Easy onto this doily from Martha Stewart. I colored it with a SU marker, added some Star Dust Stickles, and mounted it on a black circle. 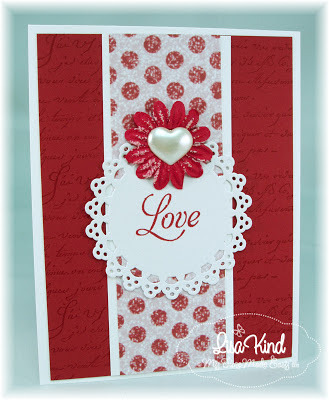 The sentiment is from the Bee-Loved Sentiments stamp set. I stamped it on a flag I die cut using the WPlus9 banner die. I added some yellow glitter dots for more sparkle. You can see more inspiration at the design team blogs. Hey everyone! Today's post is the monthly Year in Review post for My Time Made Easy. This is where the entire design team creates with products that were previously released to remind you of all the fun and amazing products that are available instantly. We just had our January release and you can see the new products here. 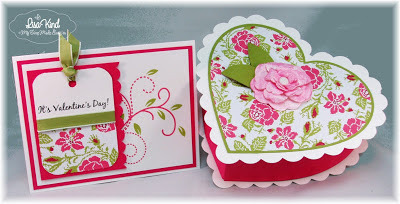 The products I'm using today are the Pucker Up template, Vintage Dots Collection 2 digital paper, and Sentimental Occasions acrylic stamp set. I started with this template. It's one of my favorites (I say that all the time, but it really is! ), and it's quite large. However, I like to play around with resizing these templates and resized this to 70% of its original size. 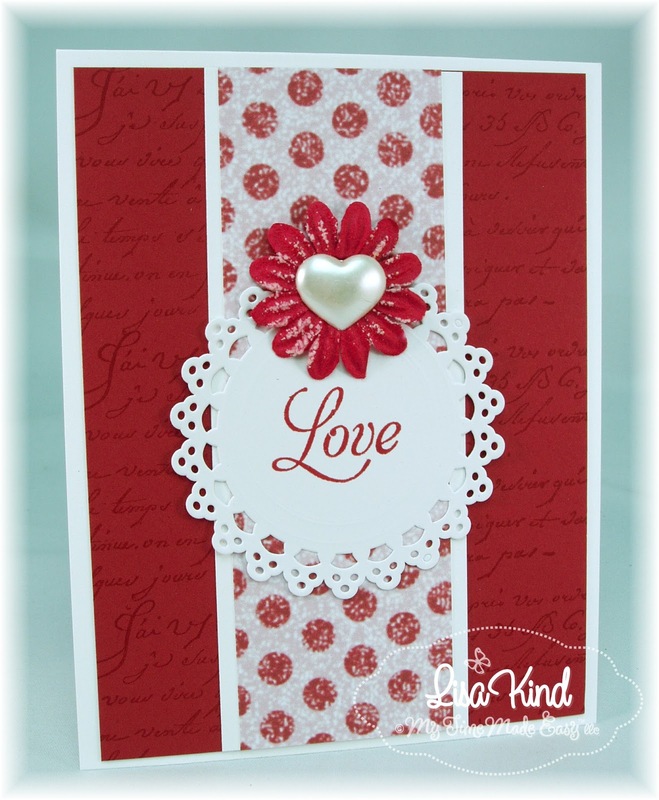 I cut it out of Riding Hood Red cardstock to match the Vintage Dots paper. This is the first time I'm using this paper, and it's really quite pretty! 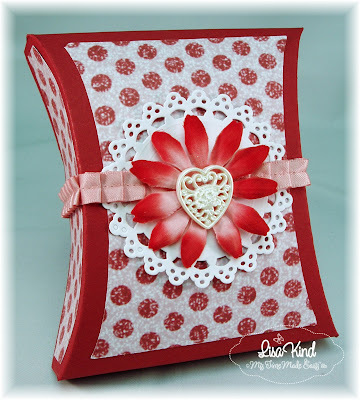 I added a white Martha Stewart doily, pink ruffled ribbon, a red flower and a pretty scrolled heart button. 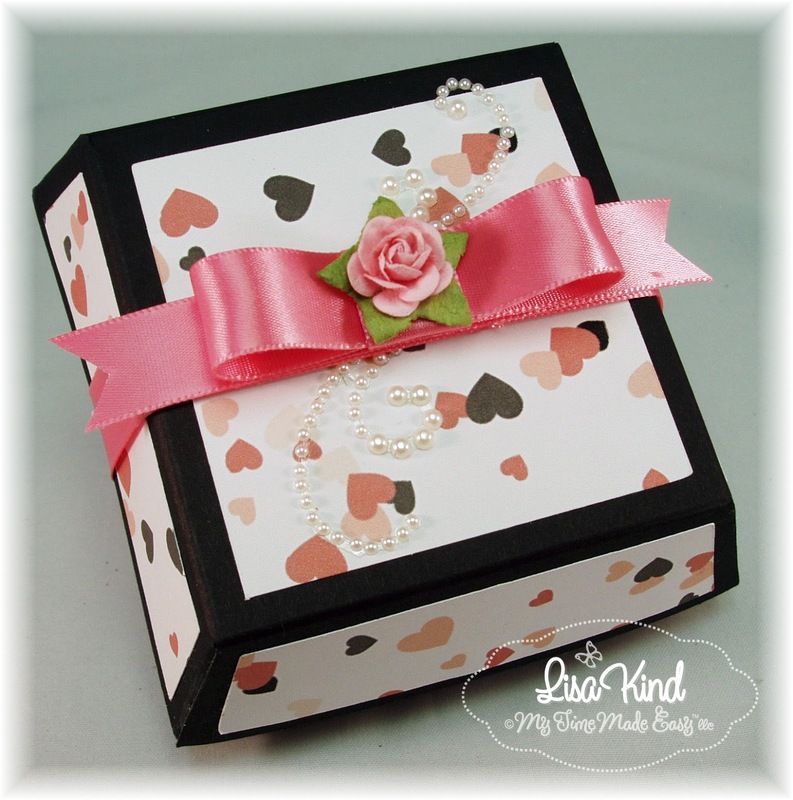 The ribbon and heart are a belly band that I created so that you can open the box. It opens from either side, not the top or bottom. 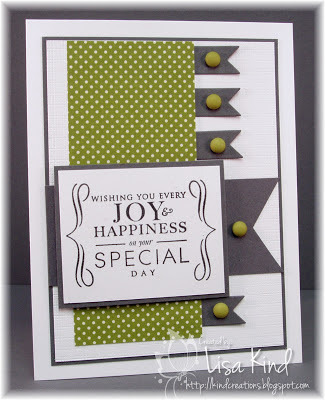 I had some some of the Vintage Dots paper left over, so I created this card. I used the same doily, but a different heart and flower. The sentiment is from Sentimental Occasions stamped in Riding Hood Red. The entire team is posting today, so make sure you visit these blogs. Hello there! 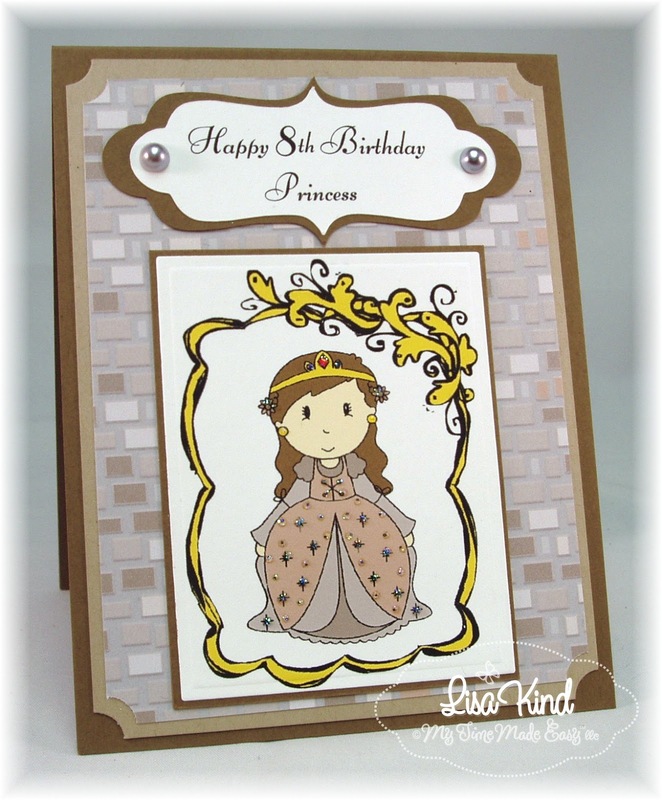 Have you seen the new products released yesterday at My Time Made Easy? Some great stuff to see! 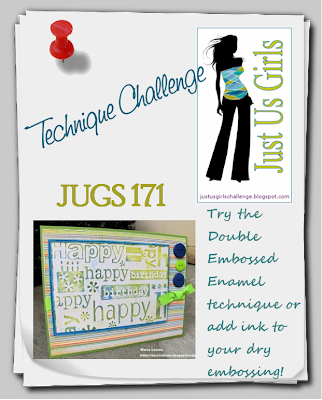 Today is our post release day posts and I have the new Just a Gift template to share with you. What a cute template! It's just a box, but take a look at the sides. They are rounded! I decorated the box with the previously released Blonde Birthday digital paper. The top is what's also different about this box. The bow is so pretty and it interlocks to close the top. The tag has some new products too. 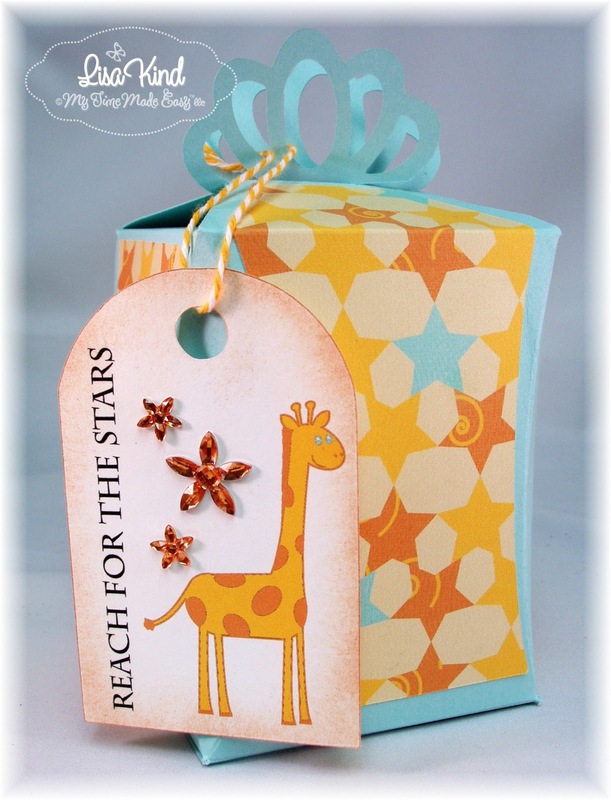 The too cute giraffe is from the new BFF Valentine digital stamp set. 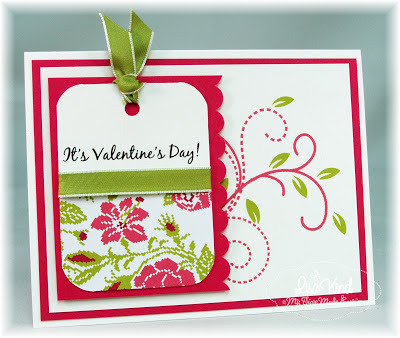 The tag was cut using the new BFF Valentine Tags cut file. The sentiment is from the previously released Lunch Box Love Notes digital stamp set. 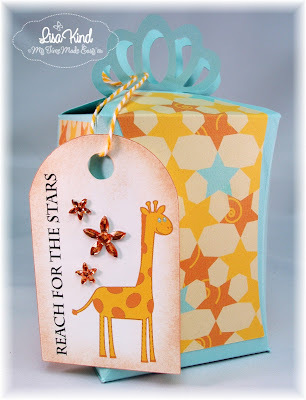 Love how the pattern paper and the sentiment tie in together. Some of the design team are posting today, so stop by these blogs to see what they have for you. 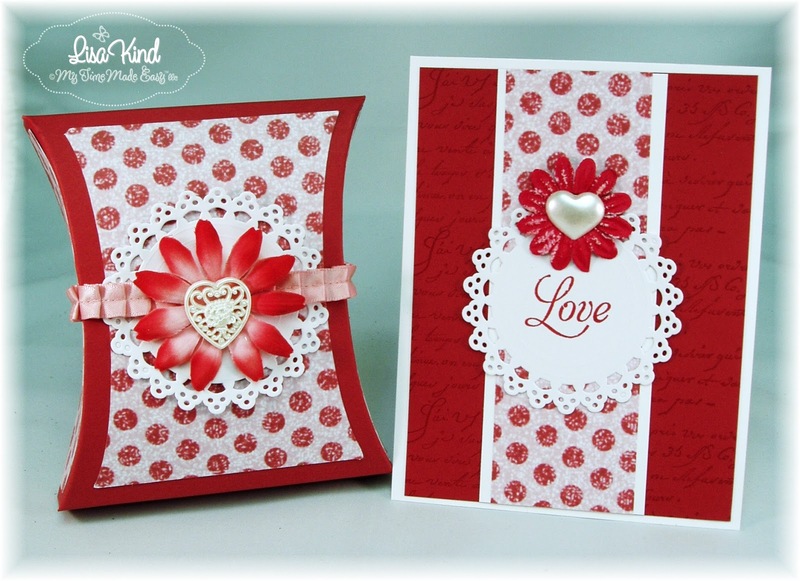 Today is release day at My Time Made Easy, and we have some fabulous new Valentine products for you this month? Have you seen the previews? 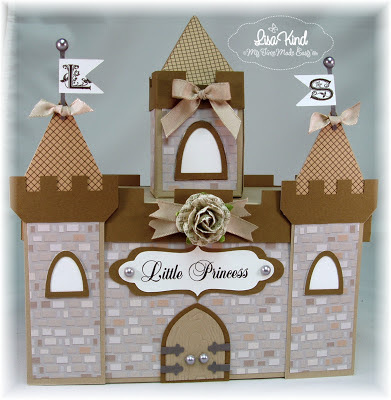 You can go to Lauren's blog and see her projects and links to the design team projects too. The all the new products here. I have the new With All My Heart template to share with you today. 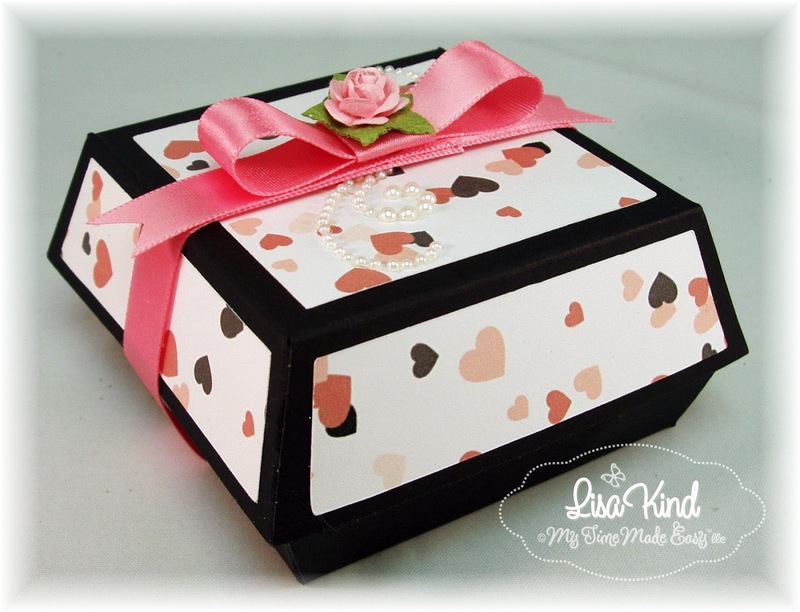 It's a traditional Valentine heart-shaped box that you can personalize any way you choose! Here's a close-up of the box. So Pretty! 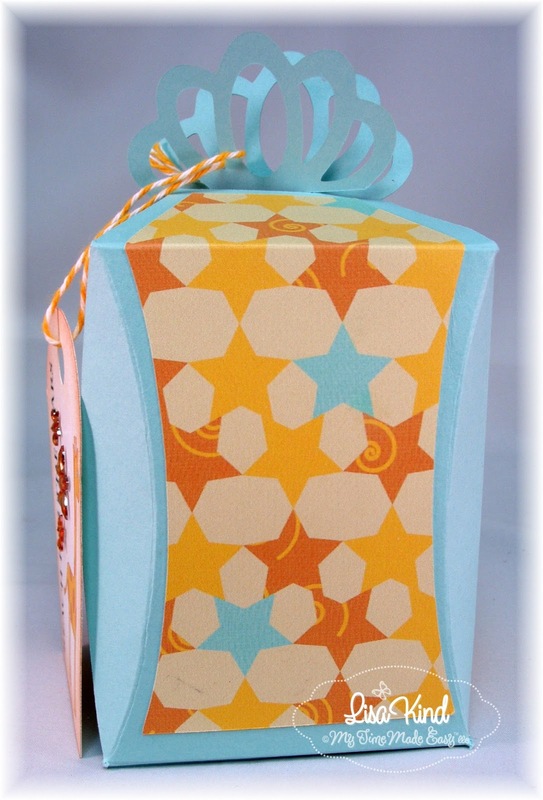 I used SU's Melon Mambo for the base of the template with the white scalloped top and bottom. 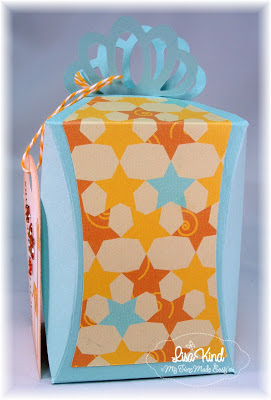 The pattern paper is from the previously released Grammy's Pretty Patterns and I framed it in SU's Lucky Limeade. 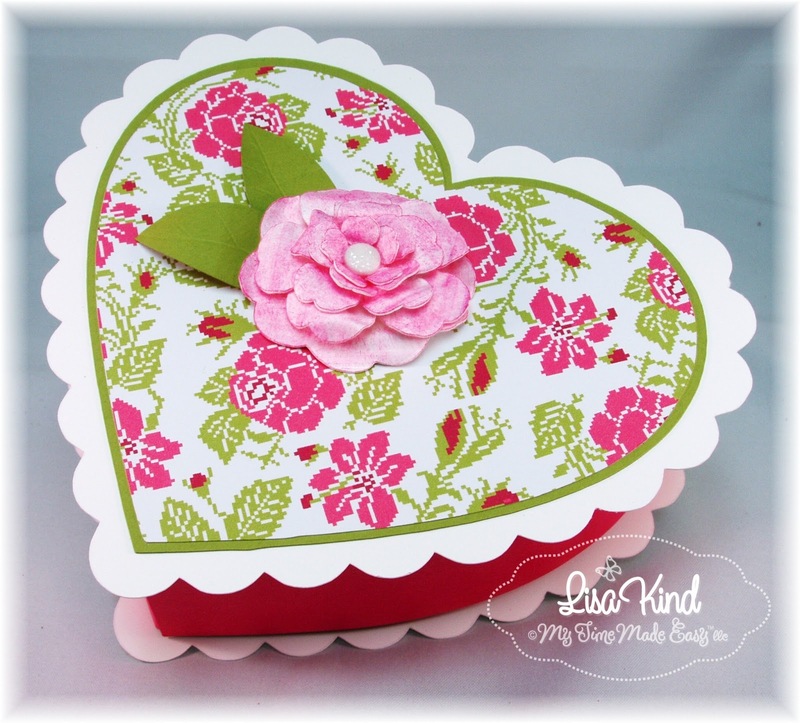 The flower is the previously released Rambling Rose cut file. Lauren has a tutorial on how to create this lovely flower. I cut it out of white paper then added some color with Melon Mambo ink. The leaves are from the Fanciful Flowers cut file. I added a white glitter dot in the center. 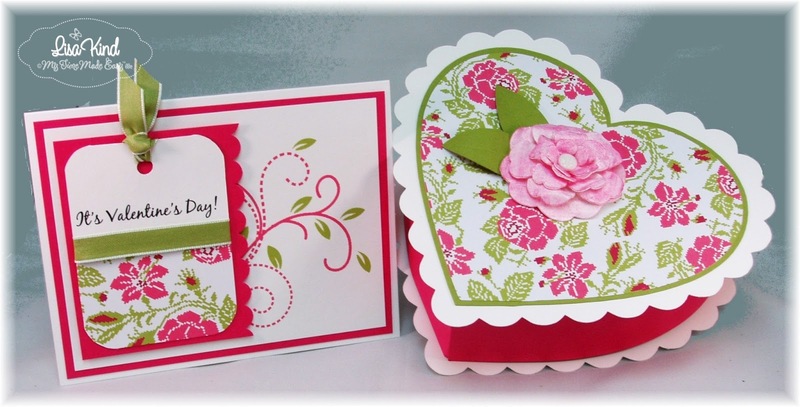 For the card, I used the same papers and added a flourish from Fanciful Flourishes digital stamp set that I colored in GIMP. 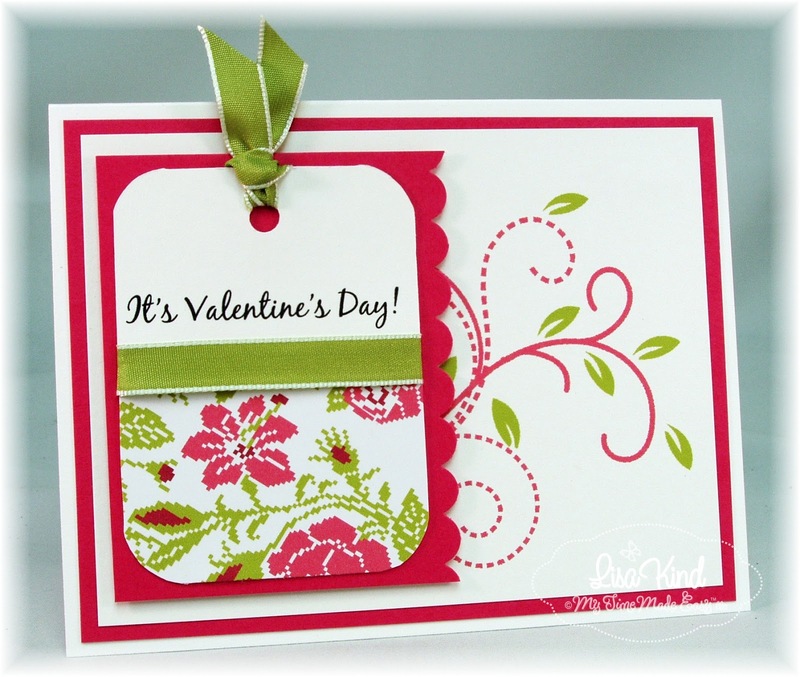 The tag is from the new BFFs Valentine Tags cut file. I just cut off the rounded part of the tag and punched a new hole. It just didn't work with my layout! The sentiment is also from the new BFFs Valentine Sentiments digital stamp set. I just used part of the sentiment. The entire sentiment says "Hip Hip Hooray, It's Valentine's Day!" So nice to work with digis, because you can crop easily! 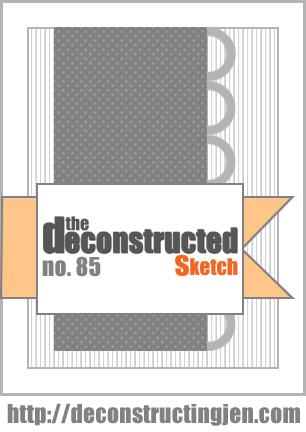 The sketch is from this week's Clean and Simple sketch. The entire MTME design team is posting projects today. You can see them at these blogs. Hi everyone! Today is the first preview day for the My Time Made Easy January release. We put it off a week so we could enjoy the holidays. The release will happen Monday, January 7. I used the new template called Clam-ped Up. It's the cutest little template! 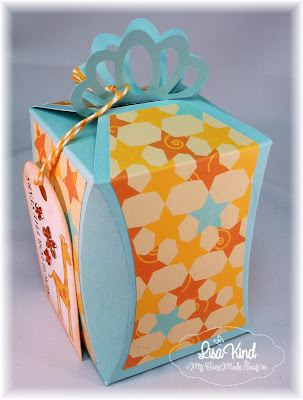 I cut it out of black cardstock and decorated it with a new pattern from the BFF Valentine Papers digital paper pack. I added a pearl flourish and a pretty satin belly band bow with a dainty pink rose. Here is the template open. 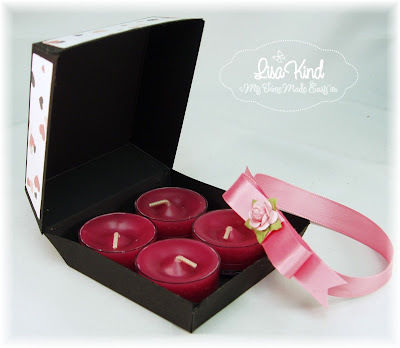 It fit four of these sweet-smelling tea lights. I told you it was a very cute template! And super easy to put together too! You can see more of the release on these blogs. Thanks for stopping by! I'll be back on Monday with the group post for Release Day! Hi everyone! 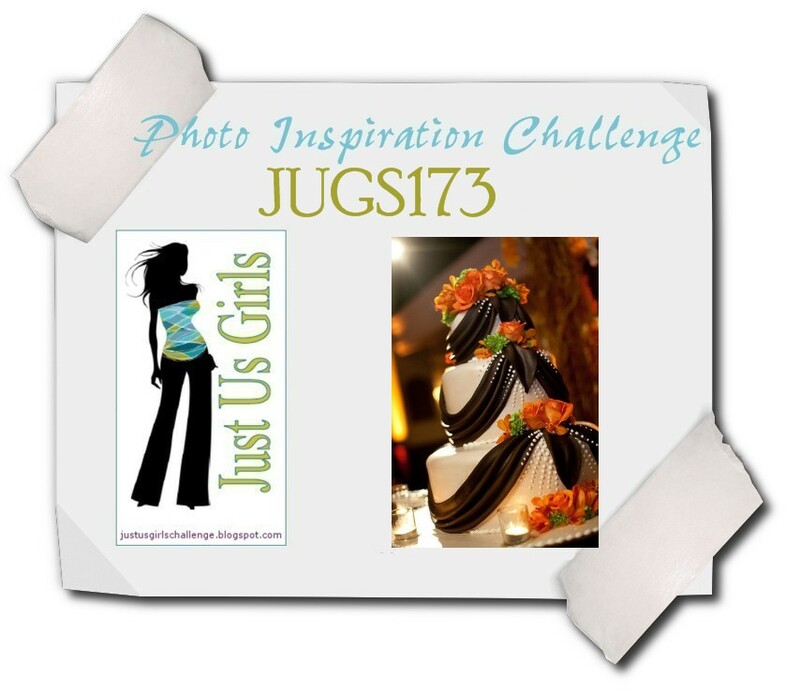 I'm here this week with the Just Us Girls sketch challenge. But first, the JUGs team has an announcement to make. Last week we said farewell to our wonderful DT member Lynn Mangan, and we have someone equally as talented to fill her spot. Please welcome Tangii Crain to our team! Tangii has been a friend since our Paper Makeup Stamps days! She's a great designer and I'm sure she'll be a wonderful addition to our team. Welcome Tangii! Now on to the challenge. 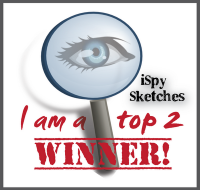 Here is the sketch that our amazing Andrea created for this challenge. ...that's what I used! The tire track is actually a SU wheel that I've had forever! I paired that panel with a car paper from the Wander paper pack by Basic Grey. 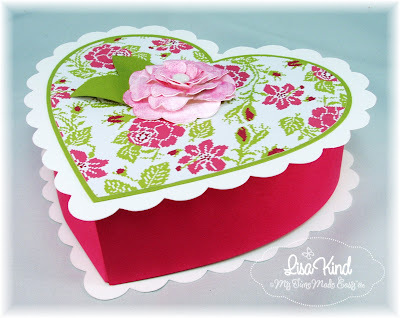 Then I added the sentiment from Paper Makeup Stamps' Home Matters set and the heart button. What do you think? I think it's kind of funny! You can visit these blogs to see some great inspiration from the design team.